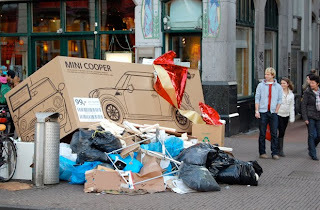 There’s a behind the scenes article in MarketingProfs today about the MINI Cooper cardboard box idea that was done in Amsterdam last December. It provides some insight around what the creative team went through, how much the effort cost (under 5,000 Euros), and how the team responded to a similar idea done a few weeks before by Heineken. You should read the article. It is definitely an unique look behind the scenes, one we rarely get in this industry. So how was the idea? Was it really “cleaver”? At first, I was a bit – so what? Who really cares about empty cardboard boxes on a few street corners around Amsterdam? Sure it’s cutesy. Yes it is typical MINI brand whimsy, but does it really do anything for the client's business? Spending under 5,000 Euros was money well spent. The idea was covered across the blogsphere and MarketingProfs had their initial MINI cardboard box article retweeted across Twitter. People really liked the concept. Sure most of those retweeting the article were probably ad industry people, but the idea also received a decent amount of attention – for a very low cost – on several automotive sites. The ad also communicated a clear, concise message. An empty box after Christmas shows everyone what you got for Christmas and a car stands out. Plus it creates desire in a fun, unique way. There’s a spark of jealousy that someone received a new MINI Cooper when all the passerby may have received were some socks and fruitcake. What’s interesting to ad people is how a simple idea like this can generate so much viral attention, especially when most viral ideas involve hundreds of thousands of dollars for some Facebook application or video web series. So, it’s refreshing to see a simple idea generate interest at such scale. The only thing I wonder is could another automaker have done this with a similar response? Yes, but few could. Maybe BMW or even Lexus as a play on their big red bow advertising. Unfortunately, I doubt a Chrysler or GM could have pulled it off. Mainly because they would’ve received backlash for not recycling or comments asking who would want a Sebring? Or can I return this Aveo before 31 days? The thing is this probably works best for MINI because their brand has a whimsy and cool image. The brand helps the idea immensely. Even so, there is a lesson here. A simple message really can breakthrough and what’s great is that the message isn’t about some complicated new technology or performance benefit. No, in this case, it’s just the simple message of desire wrapped up in a cultural behavior; everyone can see what a person receives for Christmas just by checking out the next day’s trash. I think this works primarily because if a car were to come in a box, it would be a Mini. It's almost implied by the "fun" nature of the car. I could see it working for the New Beetle as well. Agreed. VW is another brand that could pull this off with a Beetle or even a Golf/GTI. also Smart. And the box would be smaller. OK, so how would you replicate this with a Phantom, then? A Cartier-red velvet box cast on the sidewalk?